Before you buy an E90 you should probably consider ether getting a certified pre owned which provides extended warranty or getting after market insurance if your new car warranty is getting near its expiry date. Why? its not uncommon for your new e90 lifters (part of valve train) to start ticking, it happens because a minor design flaw in the head doesn’t allow for enough lubrication to get to the lifters. Usually it will occur when you drive short distances where oil cant warm up properly and thus lubricate effectively. BMW says the sound is rather harmless, but you can be the judge of that. Very short term: take it for a hard drive on the highway, this will allow for the engine and oil to get at full operating temperature and will lubricate the lifters, thus making the sound go away, but this is only a temporary fix as the problem will reoccur after some time. Short term: Bleeding the hydraulic system to get any air pockets out, usually this has the same effect as the previous but will last slightly longer, sometimes it wont work at all though. In my opinion its rather pointless to do this step ether do the earlier or latter. This is also usually the first step the dealer will take to try to mend the problem. Medium term: Replace all 12 lifters with new lifters, the new lifters will be of a new design as the ones that came with the car when you bought it are now discontinued. This ussually mends the problem ether permanently or for an extended period of time, but has been known to not fix the problem for a lot of people. This is usually the second step taken by the dealer. Long term/permanent term: The “right” and proper way to fix the problem is to replace the head with a newly designed head which has been redesigned to lubricate better. I have yet to hear of anyone where this didn’t solve their problem. Due to the expense of this process BMW will usually not approve this step util the previous have been done, but never the less will preform the work under warranty. This Service Information bulletin supersedes SI 11 09 07 dated April 2008. An occasional ticking or rattling noise from the HVA elements may occur during cold engine starts or frequent short-distance driving. In these situations, the HVA elements may not yet have been supplied with sufficient amounts of air-free oil. This condition will not cause any damage to the engine, and usually remedies itself with a longer driving distance or operating times at full operating temperature. In the event of a customer complaint, please perform the following the HVA bleeding procedure. The bleed time may take anywhere from between two minutes and (in rare cases) to a maximum of 30 minutes. This procedure is to be performed on a level surface with the vehicle stationary, and in a properly ventilated area. Bring the engine up to an operating speed (no load) of 2000-3000 rpm and maintain this condition for three minutes (bleeding procedure). Let the engine idle for 15-30 seconds and reevaluate whether the noise is still present or not. Engine quiet – procedure is finished. Engine noise is still present – repeat the procedure; perform steps #1 and #2 up to a maximum of 5 times. Only if the noise remains after performing the bleeding procedure 5 times: proceed by performing the procedure for a final time, also at an engine operating speed of 2000-3000 rpm, but for a total time duration of 15 minutes. Covered under the terms of the BMW New Vehicle Limited Warranty. This Service Information bulletin supersedes SI B11 09 07 dated January 2009. All E82, E83, E88, E85, E86, E60, E61, E70, E90, E91, E92 and E93 vehicles with N51, N52 or N52K engines produced approximately up to November 31st 2008; refer to cylinder head casting identification attachment. An occasional ticking or rattling noise from the camshaft hydraulic valve lifters (HVA) may occur during cold engine starts, due to frequent short-distance driving, or the noise may occur for an extended period of time even though the engine is at operating temperature. Improved parts were phased into production beginning on 10/1/2008 and fully implemented on November 31st 2008. Do not perform the bleeding procedure that was previously provided in SI B11 09 07 which has now been deleted. All vehicles produced between 10/1/2008 and 11/31/2008 must have each vehicle’s cylinder head casting number identified before hydraulic valve lifters (HVA) replacement, due to staggered implementation. Refer to the attachment for the casting number location. Vehicles produced after 11/31/2008 have already been fitted with improved parts. Vehicles produced prior to 10/1/2008 will require the new parts. A cylinder head casting number that does not match will require replacement of the 12 exhaust camshaft hydraulic valve lifters (HVA) as per Repair Instruction RA 11 33 050, Removing and installing/replacing all rocker arms. Only the exhaust camshaft and rocker arms have to be removed in order to replace the hydraulic valve lifters. 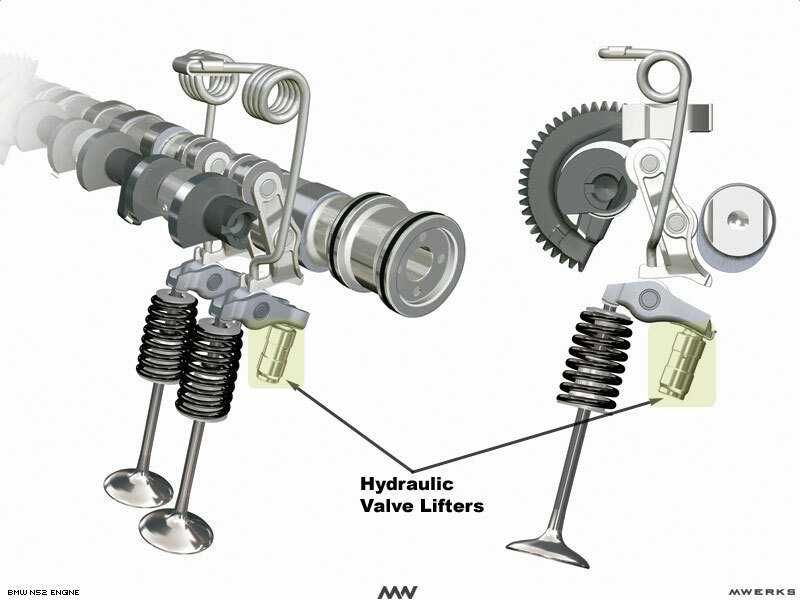 Do not remove or replace any intake camshaft valve train components. Refer to EPC for additional gaskets, seals and bolts, as required by the Repair Instructions. Covered under the terms of the BMW New Vehicle Limited Warranty, or the Certified Pre-Owned program. Please refer to the latest KSD for the applicable Main or Associated labor allowance for the specific model. Note: The following explanations will spell out the correct use of the work times. Use this labor operation number when other repairs or services are performed along with the listed warranty repair. Under no circumstances should both labor operation numbers be claimed. Attempts to claim both times will result in an unnecessary delay in claim processing and payment. This entry was posted on November 27, 2010 at 10:11 pm and is filed under Do it Yourself, Interesting Stuff. You can follow any responses to this entry through the RSS 2.0 feed.